The Rangers have informed veteran outfielder Hunter Pence that he’s made the Opening Day roster, tweets MLB.com’s T.R. Sullivan. Young outfielder Willie Calhoun, meanwhile, will be optioned to Triple-A Nashville. Sullivan also adds that Rule 5 pick Jordan Romano has been informed he will not make the roster. While many fans may have hoped that Calhoun would seize the outfield opportunity in front of him and realize the offensive potential that long provided him with top prospect status, Pence emphatically outplayed him this spring. The pair leads the Rangers in spring at-bats, but while Pence has impressed with a .356/.431/.667 batting line, Calhoun has mustered just a .217/.296/.261 output. Beyond the raw spring stats (which should always be taken with a grain of salt), the Rangers simply don’t have everyday at-bats for Calhoun in the big leagues right now. Joey Gallo, Delino DeShields Jr. and Nomar Mazara are lined up in the outfield, with Shin-So Choo slotted in for regular DH work. At this stage of their respective careers, Pence is better-suited for a bench role, as Texas surely still wants Calhoun to log regular plate appearances to continue his development. Pence, who spent the offseason making significant alterations to his swing, will seek to reestablish himself as a credible big league outfielder on the heels of that excellent spring. The three-time All-Star finished up a five-year, $90MM contract with the Giants last season and managed just a .249/.297/.368 slash over the final two seasons of that contract. The 24-year-old Calhoun, acquired as the centerpiece of the trade that sent Yu Darvish to the Dodgers in 2017, saw his bat take a step back both in Triple-A and in the Majors in 2018. After hitting a combined .300/.355/.572 between the Triple-A affiliates for Texas and L.A. in ’17, Calhoun hit a solid but diminished .294/.351/.431 in Triple-A with the Rangers this past season. In 108 big league plate appearances, he hit .222/.269/.333 with a pair of home runs. Calhoun’s glovework has been questioned in scouting reports over the years, but he’ll also look to get his swing back in track in his latest minor league assignment. He has an option remaining even beyond the current season, so the Rangers still have ample time to help him tap into his upside. Romano, 26 in a month, was selected out of the Blue Jays’ organization in this year’s Rule 5 draft and pitched 9 1/3 innings with the Rangers this spring. He allowed four runs on seven hits and five walks with six strikeouts in that time. Romano logged a 4.11 ERA with 8.1 K/9 and 2.8 BB/9 in 142 1/3 innings last year (nearly all at the Double-A level). He’ll need to be placed on the waivers and offered back to the Blue Jays if he clears. Pence also has 6 SB’s to 0 CS. Thrilled for Pence. Even if he’s playing for the lesser club in Texas, I’m going to be rooting for him. The Rangers may be in the midst of a rebuild at the moment, but they are by no means the lesser club in Texas. I mean, they’re lesser than the Astros, so what would you call it? hahahaha the astros are wayyy ahead! Glad you are happy about Pence but what an overstatement. Hopefully a team gives Romano a chance. Blue Jays certainly won’t. Aside from a bad June and 1 hiccup start in August he was outstanding. Pence will be invaluable to Texas in the clubhouse and as a mentor to their younger players. He will be missed by the Giants for his impact on the team for the above reasons. If Pence has renaissance then Rangers could be surprise second wild card. Oh wait, I forget, a lot! They have to pitch too, not just hit the dinger and have good personality. LOL, a lot! Calhoun looking more and more like a flop. Has no defensive position and if his hitting is more okay than good he’s useless. Yankees will swap Greg Bird for him. Yankees would swap Greg Bird for an empty bag of potato chips. Still young and with the weight loss that has had to affect his swing. Not every good player is in the majors in their early 20’s. Wonder if the Cubs would trade Yu Darvish for Calhoun? In all seriousness, will be interesting to see how Calhoun responds to being back in AAA. Last year he had a hissy fit and started off the season very slowly. If he can stay focused he could be on the club if a position player goes down with an injury. But as with many Rangers ‘top’ prospects he could end up as a major disappointment. Calhoun has talent but needs work. It was pretty obvious watching this spring, you can’t shortcut experience in the big leagues. With today’s pitching talent the days of swinging for the fence may be short lived (Including Gallo). Not too surprising about Romano. Jays should be getting him back to add to the young depth and it wouldn’t be surprising at all to see him in the bullpen at some point if the veterans get dealt. People should get psyched about doing things they love rather than watching others do things they love. Doesn’t sound like you’re getting all you can out of life. And you’re making an unnecessary personal attack on someone you don’t know on mlbtraderumors. Is that supposed to be a good example of getting all you can out of life? I am not getting all out of life. Can you help me in good direction? LOL, a lot! Jeez, Calhoun getting beaten out by Pence. That Darvish trade is looking worse and worse by the minute. Very true, but that trade was bad from the start. Hopefully Calhoun keeps working and eventually contributes. Now that Pence is stepping into the pitch instead dumping his front foot down the thirdbase line, he’s hitting consistantly like he did whennthe Giants picked himnup. Nice to see the veteran go out and earn the job. Hunter Pence proves that no matter how cool you are or what your job is, you still need to bring knee pads to work. Pence deserves what he has earned by hrs work and perseverance, and loving baseball ⚾️ more than most. He is invaluable both off and on the field, in and out of the clubhouse, and all around the city he plays in. Lexi and Hunter are wonderful and selfless, so giving to all they meet, and they live and breathe positivity. They are a blessing to baseball and all they meet and influence. Can’t be happier for them both!! 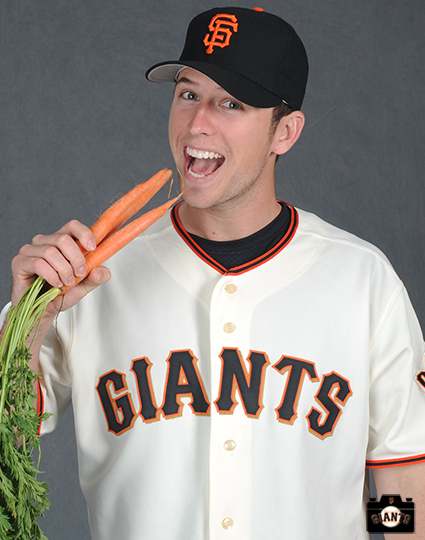 I’m a lifelong Giants fan and extremely happy for Pence. He was a great Giant and will always be revered as such. Knowing his work ethic and drive, I’m not completely surprised he made the Rangers opening day roster. I’ll be watching Rangers games this year just for the off chance of seeing Hunter’s warm up swings. I absolutely love watching Mr. Knees & Elbows play. Yes indeed. This is a very good thing. Pence is a great player and I’m glad he is with Texas. With runners in scoring position and all that is needed is to put the ball in play he’s the man I would call on. He is a contact hitter of which Texas has not had in years. Calhoun is simply not ready for big leagues, his bat control. seems to need improvement, Would love to see him be a contact hitter with control to all fields. He has the power but I don’t think he has the control to keep from being a dead pull hitter. He has the talent to overcome and I hope he does.